You are cordially invited to join us at the 2017 AAAM Annual Community Dinner. The Asian-American Alliance of Marin (AAAM) is a network of Asian Pacific Americans, organizations, and interested individuals in Marin. We serve as a resource to the greater Marin and Bay Area population by promoting justice, equality, tolerance, human rights, and understanding in our communities. If you are representing a public agency or non-profit organization, it will be a great opportunity for you to introduce your organization and services. 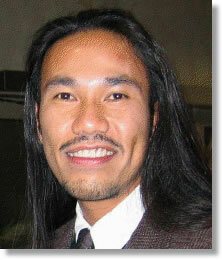 Cesar is a Filipino-American activist, educator and a culturally competent bilingual (Tagalog) psychotherapist. He was born in the Philippines where he spent the first 10 years of his life until he and his family immigrated to the San Francisco Bay Area. Similar to many immigrants’ experiences, he faced many challenges associated with acculturation and issues related to poverty. Navigating and adapting to a new environment and its cultural mainstream norms was a daily struggle. Fortunately, through the support, life teachings and guidance of his family, he was able to endure and overcome many of the obstacles that confronted him as a young person. As a young adult, he pursued a career in Social Work by obtaining his Bachelor’s and Master’s degrees at San Francisco State University. He was very clear early on in life that he wanted to be of service to disenfranchised people and communities, and the field of Social Work became the vehicle that enabled him to live out his childhood dream. He has been conducting and providing lectures, presentations, speaking engagements and workshops on multicultural issues and subjects at international, national and regional levels since 1989. He is also a proven community organizer, providing leadership and strategic development to various initiatives, campaigns and community building efforts. He brings a strong commitment to, and makes strong connections between multicultural and social justice work in his activism, and in his private psychotherapy practice. In 2008, he received the prestigious Marin Community Foundation’s Beryl Buck Achievement Award for Social Justice. He is also the recipient of the Martin Luther King Humanitarian Award from the Marin County Human Rights Commission and the Benjamin Dreyfus award from the ACLU. He is a former Chair of the Marin County Human Rights Commission and has served on the board of directors for numerous local organizations. Currently he is a board member of the Prison Law Office, and of the Canal Welcome Center in San Rafael, and serves as an advisor to the Marin Foster Parent Association. Vince earned degrees from the University of California, Berkeley (BA in Mass Communications, with high distinction) and San Francisco State University (MPA, nonprofit administration emphasis). He completed his designation as a Certified Specialist in Planned Giving from the American Institute for Philanthropic Studies at Long Beach State.